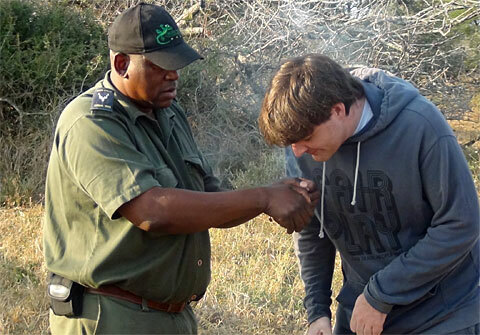 Safari time – Pre tournament preparation! The journey to Heathrow during the day is definitely a lot easier than coming back from Stansted at night, and I was at the terminal within an hour of leaving the house. As I arrived to check in for my 18:50 flight to Madrid I was told that it was running late and so was advised to switch to the 17:30 flight instead. That didn’t give me much time but made it onto the plane and had a smooth journey on Iberia to Madrid. This was basically a “no frills” flight. Refreshments had to be paid for and there was no real entertainment service but I slept for an hour, read a bit more of the interesting book, ‘The Stories of English’ by David Crystal and a bit of PSP playing and I was there at about 9.30pm local time. I had plenty of time to make my connection onwards to Johannesburg at 00:10 so made my way leisurely across to the other terminal, sat at a café and grabbed a sandwich and a beer and it was soon time to make the next flight. Not much to say about that one either really. I knew from last time that Iberia don’t have an in-flight interactive entertainment service but I had a couple books, ipod and psp so I was sorted. Amazingly I even managed to get a few hours sleep and so wasn’t feeling completely dead when I arrived at J’burg the following morning. I was met at the airport by Hendrik, one of the organisers who’d kindly agreed to pick me up. After a quick detour to pick some stuff up at his house and allowing me to get changed and feel more human we were off on a trip to the Kruger Park to go safari! Hendrik isn’t a slow driver by any means, yet it still took us 5 hours but the journey was pleasant and by the evening we’d met up with the others staying at the Hippo Hills lodge: Graham, the chief organiser, Dave and Tristan two good Aussie friends and the 3 Indian girls, Eesha, Harika and Meeni. The house has a wonderful view out across the river and across into the Kruger Park. The others were still out trying to find exotic creatures so we opened a couple beers and sat out admiring the view. Immediately we spied a crocodile or two swimming in the water and decided that we should probably not go for an early dip! The others soon came back and Hendrik started up a braai, a South African form of the BBQ. Huge tasty slabs of meat were given to us while Tristan, in an attempt to offer a healthier option, made a salad. A pleasant dinner but then off to sleep early as we were all exhausted while we had a very early start the next day. I set my alarm for 5 and by a bit before 6 we were on our way into the national park. We met up with Billy, our guide, and after a few words of warning we were off on our walk through the park. This may seem trivial but this enormous national reserve hosts lions, elephants, buffalo, rhinos, hippos, leopards and more so we had to be careful. I found the walk stimulating. It’s good to walk through the terrain and see the animals up close in their natural habitat. We saw lots of impala (a sort of small deer style animal), zebras, giraffes and got up real close to a white rhino without it spotting us. We also learned the difference between elephant, white rhino and black rhino dung and even smoked some elephant dung which is apparently good for headaches and sinus trouble! NB: Now Gawain has internet access and we’ll be able to upload his posts in some sort of orderly fashion atm he is on 5/5 facing Nicholas van Der Nat who is a full time coach in Johannesburg – the last time they faced each other was during the South African Open Championship in which Gawain played online when we lived in Melbourne, Australia. He’s off for a long rest now having had a hectic week!